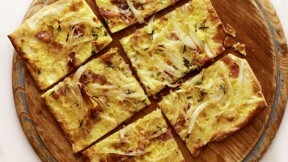 This tarte flambée recipe from Martha Stewart makes four small pizzas. Gently shake pizza on peel to ensure that pizza will slide easily onto pizza stone. Open oven door and align the front of the peel with the back of the stone; swiftly jerk peel backward to release pizza onto one side of the stone. Bake, rotating with a large spatula halfway through, until crust is crispy and golden, 8 to 10 minutes. Remove pizza from oven and top with additional creme fraiche and thyme leaves. Repeat process with remaining pieces of dough. Cut into squares and serve immediately.